- A comprehensive medical guide to common ailments . . . and much more Caring for Your Teenager is the one guide that no one entrusted with the care of a teenage child should be without--a book that provides parents with all the information they need to ensure that their child is on the right track to becoming a happy, healthy adult. Expert, authoritative guidance you can trust on helping your teenager cope with the changes and challenges of adolescence, from The American Academy of Pediatrics. 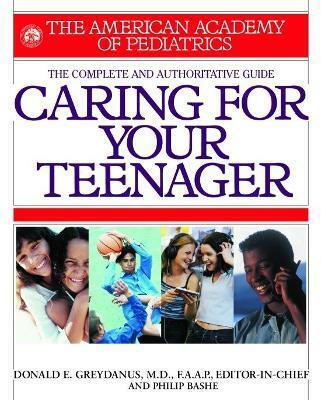 Caring for Your Teenager is the one guide that no one entrusted with the care of a teenage child should be without--a book that provides parents with all the information they need to ensure that their child is on the right track to becoming a happy, healthy adult. Donald Greydanus is the director of the Pediatrics Residency Program at MSU/Kalamazoo. He has published extensively on adolescent health, including 150 book chapters and more than 200 articles. He has testified before Congress on corporal punishment. Philip Bashe has authored or coauthored 18 books and edited hundreds more. He has been the president of Basher Bookworks, Ltd. since 1987. In addition, he has worked as an editor at several national consumer magazines, as well as a writer for The New York Times Book Review, Buffalo Evening News, and other publications.